If you ask me as a photographer, which rounds of rally I preferred the most? It would certainly be Perlis by miles. Perlis is a unique place, a majestic one indeed. The sky is always blue, the landscape is breathtaking, and it has open fields everywhere allowing me to shoot the rally cars from far away. By doing just that, I can include the cars plus the scenery into an image. Hopefully creating a composition that will reflect the beauty of this place. This is what I’m talking about. Open fields everywhere. Shame I didn’t bring a super telephoto lens this time around to catch some close action shots. But then again, close action shots can be taken from close range. Only if you are brave enough. (Picture Above) Siraj (ex-rally driver) on the left is looking at one of his ex-competitor. My favorite spot. The lake. Pictured above is Cody Crocker passing by. Cody Crocker yet again passing by the tower. Favorite spot for children. I’m considering a shot from the tower, but the local kids have fully occupied the spaces and you don’t fight kids. So I guess maybe next time. Local hero Karamjit is fast. However still wasn’t enough to take the fight to Cody. Karamjit is a delight to watch. He sweeps the bend with a style of his own. A subtle style, smooth yet so fast. I bet he must be so comfortable inside the cockpit. Hafiz Wan Mohd and SM Jeffry preparing at start of the stage. Full of concentration. Hafiz Wan Mohd. Portraits of drivers before the start is a ‘must have shot’ in my book. In my opinion, if you don’t have these kind of shots and still you published it to an audience, it would feel as if the event is quite lifeless. Another one from Karamjit. Malaysian rally legend. I burst the shutter, and found this shot conveys the mood pretty well. Just like what I have in mind. Rafiq in action. Perlis rally is popular with the local crowd, that is a good sign. Hoping for more sponsorship to come in for the betterment of rally Malaysia. Cody Crocker waits for Katsu Taguchi to start his stage. Cody Crocker’s helmet is a thing of beauty. Rafiq. Last year’s MRC champion. Francis and his co-driver having few light moments. As for me, I was having a good time in Perlis. Looking forward to rally next round and this time hopefully I will be better geared up in terms of equipments. And for you the rally fans out there, stay with us this season to follow MRC exclusive from racerevo. 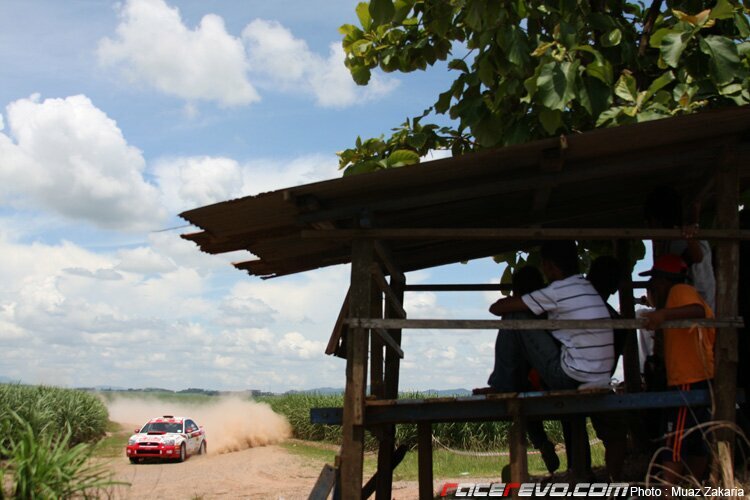 Malaysian Rally Championship Round 2 at Negeri Sembilan Day 1 - Karamjit Let Fly His Evo!